The past year has been a very exciting year for the Punjabi Language Education Association (PLEA) and well- wishers of Punjabi. Some concerns regarding Punjabi signage at Vancouver International Airport (YVR) were brought to our attention. Consequently, PLEA led a delegation consisting of a number of prominent members of our community and met with YVR officials. They were very receptive to our suggestions. Consequently, Sadhu Binning and I had a very comprehensive tour of YVR including the secure areas .We were accompanied by the YVR officials and CBSA reps at the airport. Sadhu and I made a number of suggestions for improved Punjabi signage at the airport. The officials agreed to implement those suggestions. It is our understanding that Punjabi signage at YVR has been improved as a result of our lobbying. However, a lot more needs to be done in this regard. PLEA will continue to work on this. Our efforts in facilitating Punjabi language classes in public schools in Surrey and elsewhere continue. A number of PLEA Board members met with Mr. Jordan Tinney, Superintendent of Schools in Surrey several times and conveyed our concerns about the future of Punjabi especially at the elementary level. Without our prior knowledge or information, Surrey had declared the three elementary schools-Strawberry Hill, Newton and Beaver Creek- where Punjabi is being offered as district programs. It means that if any student in any other school wants to take Punjabi classes, he/she has to enrol in a class in one of these schools. This is extremely difficult for parents and children. PLEA’s position is that Punjabi classes should be available in any neighbourhood school if there is enough interest. Chimney Hill elementary school is a case in point. Nearly forty students have signed up to take Punjabi there. The parents, along with PLEA reps, have met with the school board officials requesting that Punjabi classes should be made available there. PLEA is continuing to work with parents and school district administration in this regard. Recently, Surrey school district has undergone a review of programs like Punjabi. The Punjabi community and PLEA have actively participated in this process. We are hopeful that as a result of this review Punjabi classes will be available in a child’s neighbourhood school. On behalf of PLEA I would like to thank the Surrey School Board and its administration for their continued commitment to Punjabi language in the district. Also, I would like to congratulate Gurpreet (Garry) Thind for his election as Trustee in Surrey. PLEA is very pleased to work with him in promoting Punjabi language instruction in Surrey schools. At the same time, on behalf of PLEA I would like to thank and congratulate parents, students and teachers of Punjabi throughout the Metro Vancouver area for doing an excellent job in promoting our mother language. Here it may be appropriate to mention that PLEA has been advocating for Punjabi in BC ‘s public schools as a second language. There is some confusion that we may be asking for Punjabi immersion. This needs to be clarified. Our request is for implementation of Punjabi as a second language as laid out in the provincial language policy. Every year PLEA celebrates International Mother Language Day (IMLD) in February. This year again IMLD was a great success. More than 200 well-wishers of Punjabi took the time to join in the celebration at North Delta Recreation Centre on February 21. It is hoped that sometime in late October or early November another function focussed on students and organized mainly by teachers with support from PLEA will be held. In short, lot has been accomplished in promoting Punjabi at every level. However, still a lot more needs to be done in this regard. It is only possible with community’s support and encouragement. It is a pleasure for PLEA to note that last year, ICBC started offering its claim services in Punjabi. Similarly, there is a lot of Punjabi signage around Metro Vancouver’s City Halls, hospitals, banks, credit unions and businesses. We Speak Punjabi signs at various places make us all proud. However, there are still a number of challenges ahead of PLEA. These include lack of resources for teachers, lack of appropriate funding especially at the post –secondary level, Punjabi translation and above all lack of pride in our mother language in some quarters in our community. In some cases, there aren’t enough students to start or continue a Punjabi class. 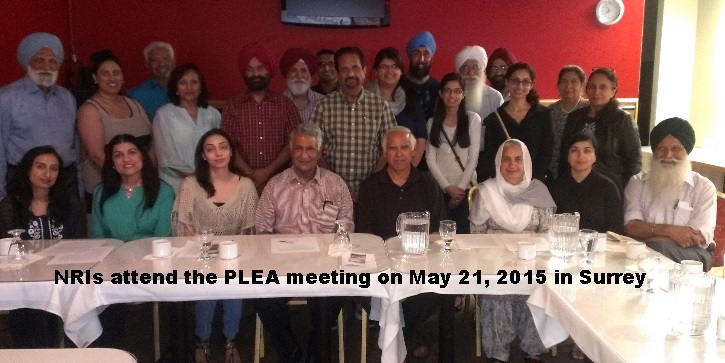 PLEA is also very concerned about the Rogers decision to discontinue OMNI Punjabi News as of May 7. This news program has been a great and valuable resource for our community for many years. At the school level, it has been widely used as a teaching tool by the teachers of Punjabi. PLEA fully supports any efforts by the community to lobby Rogers and the CRTC to restore the OMNI Punjabi News as it was prior to May 7 as soon as possible. PLEA is also in the process of arranging a meeting with BC’s Minister of Education to discuss changes in the provincial language policy. Finally, I would like to thank my fellow Board Members, Indo-Canadian media, well-wishers of Punjabi and our community for their on-going support and encouragement.